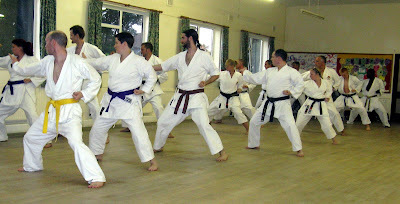 On Thursday 21st August 2008 Sensei Scott instructed at the Haxby dojo, while visiting his family in Malton. We don't have the opportunity to train with Scott very often and despite Helen, Rebecca, Sam and myself just returning from Italy we were not going to pass it by. 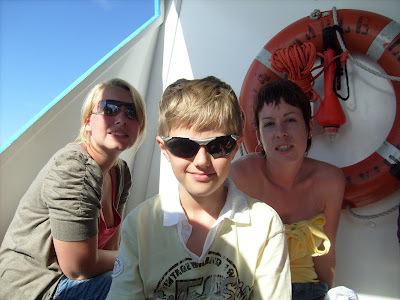 Dave, Claire and Emma also travelled from Selby for the session. 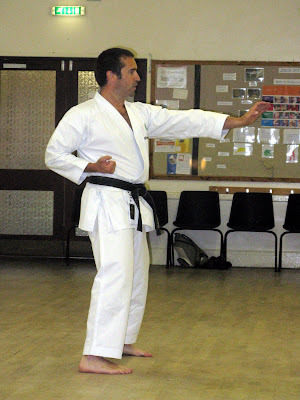 Sensei Scott is a graduate of the JKS Hombu dojo Instructors course, one of only a handful of westerners to complete the course, he is the technical director of the JKS GB & Ireland and has a string of dojo where he is based in Dublin. Sensei Scott's session was based on the differences of snap and thrust techniques. 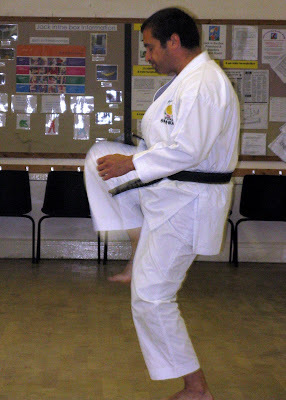 Scott demonstrating the need to pull the leg tight into the chest while kicking Mae Geri. 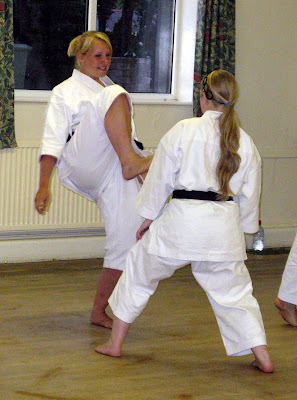 Rebecca pull her leg tight in to execute the kick on Sensei Helen. As you would expect we started with Kihon, Scott was promoting the use of the natural residual energy from the first technique to be used in the second. The important point was to let your body use this natural energy instead of wasting it with poor technique. Sensei Mike, Don and Claire in the foreground punching Oi Zuki. Dave attacks Mae Geri against Michael from York dojo. 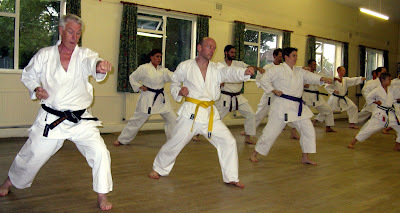 Sensei Scott developed the principles learnt in Kihon to the Kata Bassai Dai. We would like to thank all the KUGB karateka that supported the course, due to holidays I think the dojo may have been a little empty without you. Pictured above is Sensei Randy Williams 6th Dan KUGB with Sensei Ian Shaw from Haxby dojo. 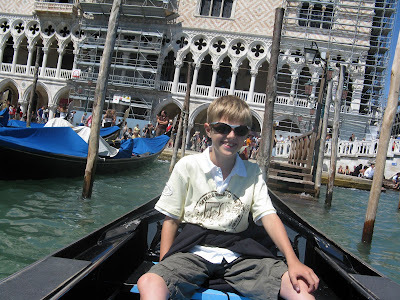 Sam seemed to maintain a good balance of training and enjoying what Italy had to offer. 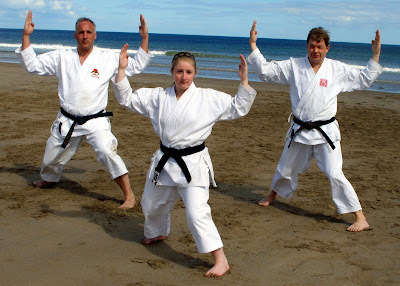 We performed quite a few kata during our morning beach training, to the front of Sam is the Bulgarian chief Instructor. Sam is one of the early karateka to attack Sensei Milena. As with all competition there is a lot of waiting around. Sam had the honour of leading in the England team, despite it having the union flag and not the George cross on it. Sam has bags of potential which I am sure will be realised over the next few years, at only eleven years old it is all in front of him. 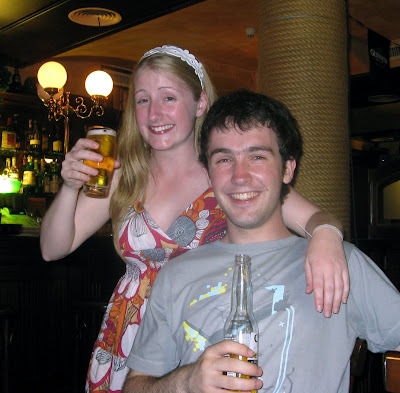 Sam seemed to do more than his fair share for international relations, his biggest fan was one of the bar maids at the sports village, who was fascinated by Sam's "lovely blue eyes" ...uck! 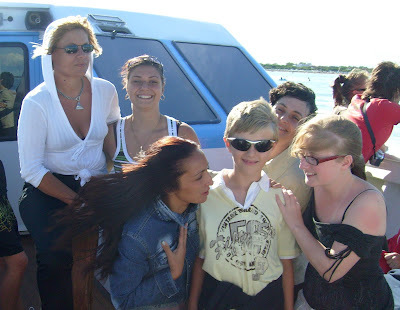 Sam uses the 2 hour boat trip to Venice to chat to his increasing fan club. 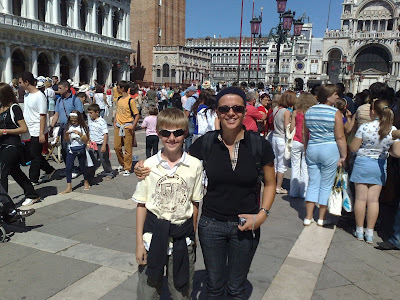 I am sure Sam is now taller than Sensei Helen, but not in Italy, Helen brings him down to size. 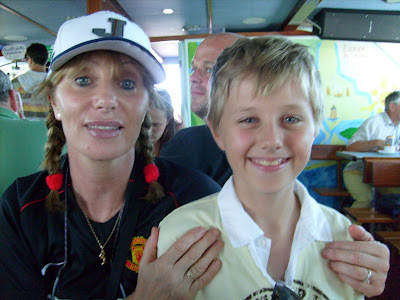 Sam, you will soon have to start your own international fan club to keep up with all your admirers. Sam was drawn against the eventual winner of the kumite for his age group, he put up a good challenge, but it was not going to be his day. 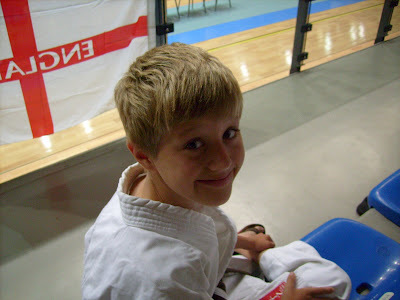 Sam is looking forward to the JKS competition in November and Italy was the ideal start of his preparation. We would like to thank "J Rotherham Masonary Limited" (Sam's Dad's employers) for their sponsorship towards Sam's costs. Sam fitted in so well with the entire England team and showed maturity beyond his years, he was an absolute pleasure to have him with us. We look forward to you joining us at Whitchurch in the future. Rebecca had a hard fight, we were all very proud of her efforts. You can't always win, but you must always compete with good spirit and etiquette. Rebecca told me afterwards that she was glad that Sensei was refereeing the match because she felt safer. Rebecca walked away a little dazed, with a few small cuts to the lips etc, but it hasn't broken her spirit for kumite. At just 16 there is still a lot to learn. Helen was drawn against Jackie from Ireland, a very experienced karateka that has spent a while training with the SKI. Simon was drawn in the senior kumite against a very experienced 4th Dan, he did well to hold his own before an unfortunate clash of legs led to the end of Simon's competition. In Hungary 2007, I was drawn against the Hungarian Chief Instructor Tamas, he went on to win, easily. I turned and said to Brian Toomey that I would be happy with anyone but Tamas. I was waiting to be called up, my name was called out and Tamas immediately afterwards. I had rushed in a bit last year so had to change my tactics this year. I didn't win but I was happy with my effort. May be we will meet again in 2010. 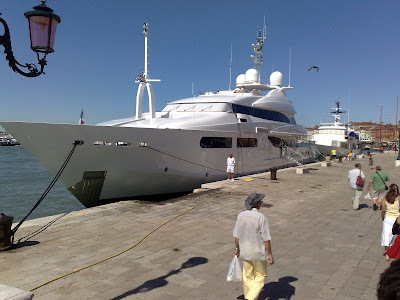 If you were unable to join us this year what about Estonia in 2010, next year there will not be a championship, but there will be a European Gasshuku and Seminar at Lake Balaton in Hungary between the 8th and 12th July 2009. 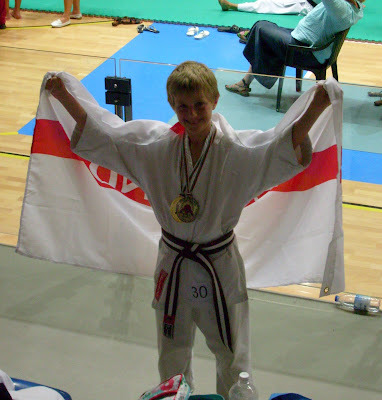 We would like to take a few more karateka from Yorkshire in 2010 so keep up the training and set your sights on a medal for England in 2010. Rebecca, Helen, Sam and I were joined by Simon from Haxby club on our trip to Italy to compete in the European championships. We took Sensei Keith and Ian from York and Haxby to keep us on the straight and narrow. We flew out on the Sunday and had Monday and Tuesday as free time. It was useful for Simon, Sam and myself to use this as an opportunity to have Sensei Keith give us some focused competition training. We trained for 2 hours in the morning and afternoon on both days. It kept us out of the sun and got us used to the mats etc. The girls did their own preparation to ensure they tried to keep injury free, this included the beach and the Irish Bar! I think Helen may have had too many liquids and Rebecca doesn't seem to have her mind on karate. 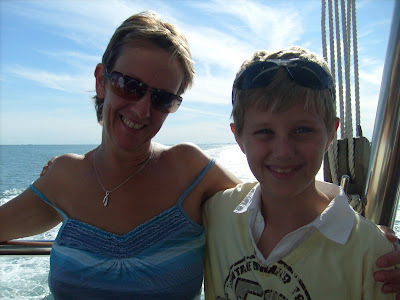 Jordon has travelled to train at York before and is soon to spend his gap year in Japan. During his time there he will be training with Okazaki Sensei. 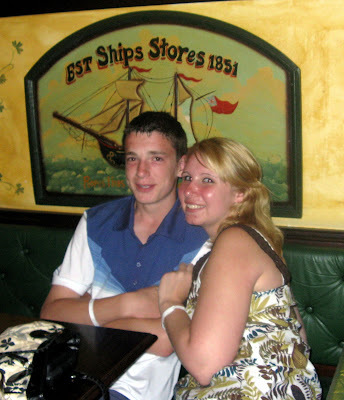 Jamie's dad, PJ, informed us in Ireland that Jamie would not be competing in Italy. Rebecca never believe what those Irish men tell you! There was a training course with Sensei Kato and Okazaki on the Wednesday and Thursday followed by the competition on the Friday. 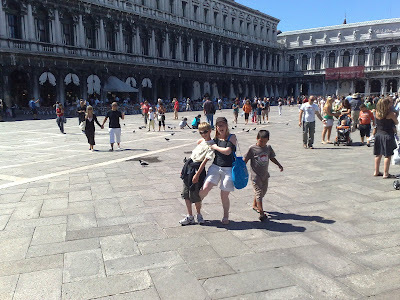 Saturday we enjoyed a trip to Venice. Above: The Square was particularly busy. 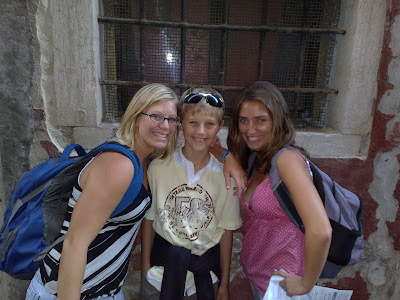 Italy was hot, damn hot. 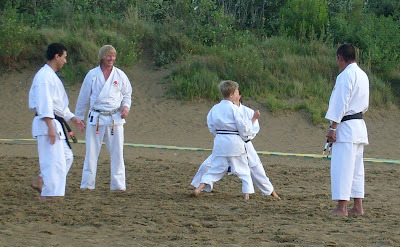 So Sensei decided it would be best to commence training on the Thursday at 06.00hrs on the beach. 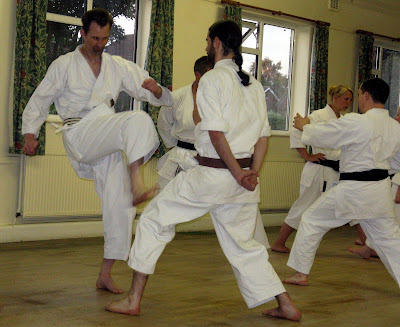 The training was lead by Sensei Kato and Okazaki, Sensei Okazaki was focused mainly on Kihon training. Unfortunately I don't have a good video clip of Sensei Milena from Bulgaria who for her birthday faced a line of over 100 karateka in Ippon Kumite, after she finished she dropped to her knees in exhaustion...happy birthday! P.S. never let Sensei know it is your birthday. The Friday came round quick and the competition was due to start at 08.30hrs, we thought the Pee Wee grades were going to be on first but no, Rebecca was called up to perform her kata, the first person to perform in the whole competition. Rebecca had been practising her Bassai dai, but then decided to perform Nijushiho at the last minute. Young Sam was up next with his kata performance, It was a very big stage to be standing on for an eleven year old and Sam was disappointed that he did not perform as well as he could have. Sam we were all very proud of your efforts, competition is a learning experience, you need to get a few under your belt, then you can get to the stage where you enjoy them. Next up is Helen, Helen had been suffering with her back all week but still competed, you can see in the video how uncomfortable she looks. I was drawn against Brian Toomey the Irish Chief Instructor in veterans kata, after suffering from the "frozen kata" I was pleased to get to the end with out stopping. 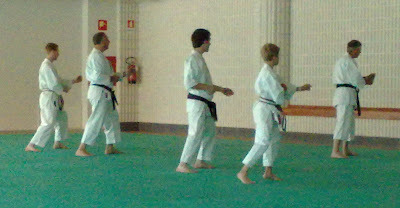 Simon was also drawn against Sensei Brian in the senior kata, it was to be an unfortunate draw for both of us. Simon's performance was commended by a number of the Whitchurch mafia and I think he was unlucky not to beat the IJKA general Secretary. 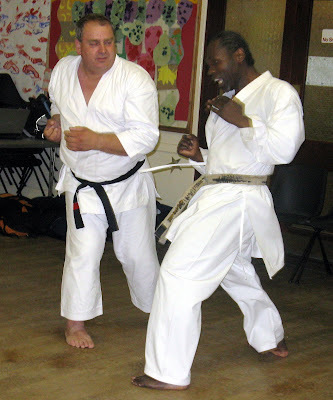 On Thursday Night Sensei Scott Langley will be instructing at the Haxby dojo from 19.30 to 21.30hrs. Only £5, yes £5! Hope to see a full dojo for an excellent instructor. Just a quick post to update you all. Competed well in both kumite and kata, with a stronger performance that last year despite a few back problems. A bit a daunting experience for young Sam, a first step into European competition, we were all very proud of your efforts. Very strong performances in both Kata and Kumite for you grade and experience, well done. More to follow at the weekend hopefully. Next week Helen, Rebecca, Sam, and I are off to Italy, travelling with us will be Sensei Keith from York , Simon and Sensei Ian from Haxby dojo. With family and friends we total 10 from IJKA Yorkshire meeting up with 9 from Whitchurch dojo, to travel from Liverpool early Sunday morning. 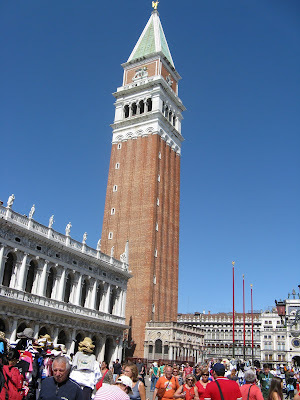 The championships are being held at the Ge Tur sports village about 45 minutes from Venice. The club has made a significant contribution to Sam's costs of joining us. He is very excited about his first European competition. 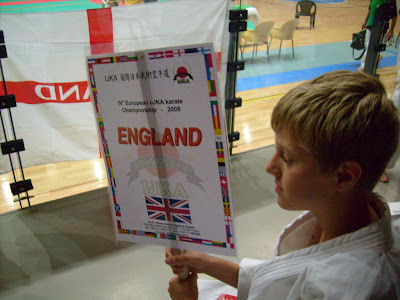 Looking a little ahead to November, I would like to take a team from IJKA Yorkshire to the JKS Open in Nottingham. If anyone is interested from any of our clubs please let me know asap. STOP PRESS!.. Sensei Scott Langley JKS GB and Ireland will be at Haxby on Thursday night 21st August, can you all put the date in your diary and attend, thank you! Is it Ochi Sensei in the famous picture at the cliff at Shimoda? 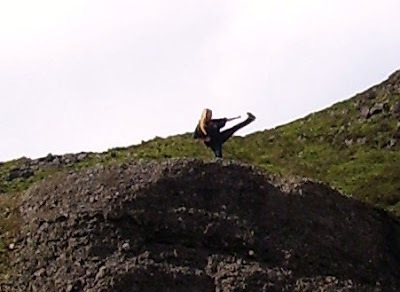 No it is Milner Sensei as she demonstrates a yoko-geri in masterful form on a waterfall in Co. Waterford, Ireland. Well, nearly masterful, it was about the 4th attempt because the cameraman was playing up, toes down a little more next time, but you did very well holding yoko geri at that height. Sensei Helen was in what could be best described as a playful mood all weekend, she was there to enjoy herself and with her new found confidence after breaking a few UK Karateka over the last few weeks, thats exactly what she did. After continually attacking Gedan because she couldn't reach Jodan the Garda had to be called, and our own pocket SOCO was on the other side of police questioning for a change. 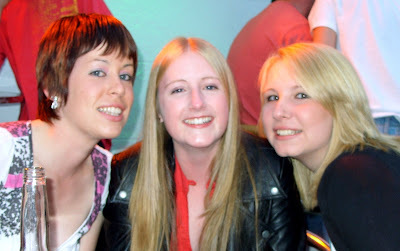 After many attempts of getting passed the bouncers in the local bar she decided it was best to sit outside, seen below Claire, Helen and Rebecca. Ireland, watch out, She'll be back! "The sad bunch of karate-ka we are, we spend most of our time either in the dojo training or away from the dojo talking or thinking about karate in ways in which we can all maximise our own development and each others knowledge.This started in the dojo with flip cards, whereby having picked a flipcard with a kata written on it you had to adopt a position / stance of a kata so as this kata was recognisable apart from any other. As you can imagine this generated some very technical discussions and has been a great source of learning not only in the dojo but also in the bar afterwards or wherever you may be ! But it hasn't stopped there. Mobile phones were being used to text photographs of karate-ka in a said position / stance of a kata but taken in unusual places ( Asda - Morrisons - Hospitals etc ). Unfortunately this practise has now taken on a life of its own. It is now only acceptable to submit photographs if a wearing a Gi. This has reduced the trips to Asda etc but being Karate-ka we have become more resourceful. 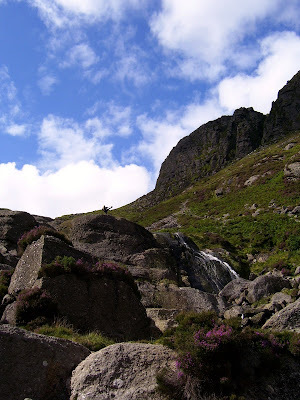 Please have a look at the photos listed and submit any for inclusion. Be mindful that any submitted will be vetted by 'The Committee' and should the location of the photograph be poor or the stance / position be found in other katas then be prepared for some friendly banter !Oss"
and sent it to the committee, I was surprised it was included and ever more surprised that we got no banter reference poor stances/technique.